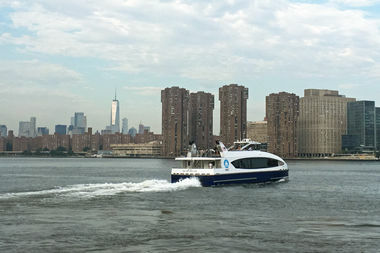 A NYC Ferry boat heads to Manhattan from Long Island City. HALLETS POINT — The newly launched Astoria NYC Ferry route saw more than 28,000 riders use the line during its first week of service — surpassing ridership on both the Rockaway and South Brooklyn ferry routes during the same period, according to the city's Economic Development Corp. The Astoria route — which connects stops in Roosevelt Island, Long Island City, East 34th Street and Wall Street — counted 28,115 riders from Aug. 29 through Sept. 5, including 6,200 on Labor Day alone. The EDC initially projected that the route would service 1,800 riders per weekday and 3,300 on weekends, according to a spokeswoman. The new line had more customers than both the South Brooklyn and Rockaway ferry lines during the same week, with 21,777 and 27,003 riders, respectively. The East River route, which has been in service since 2011 through another company, saw the most riders that week compared to the other three lines, with 47,330 people taking the ferry. Demand for the citywide NYC Ferry has been high since the system launched May 1 at the cost of $2.75 per ride, attracting crowds that have sometimes resulted in long lines and riders stranded on ferry docks for an hour until the next boat arrived. The system hit the 1 million ridership mark at the end of July, about a month earlier than projected, officials said. A spokeswoman for the EDC said the Astoria line has been running smoothly so far, with the exception of a handful boats that reached capacity during peak times, including on Labor Day, when the system saw record-setting numbers. The city plans to launch additional NYC Ferry routes in The Bronx and the Lower East Side in 2018. Fares, which are heavily subsidized by the city, are $2.75 per trip. They allow a free transfer to other other NYC Ferry boats, but not to the MTA's subways or buses.